It does look very comfy cozy! Do you have a couch for your Mom? 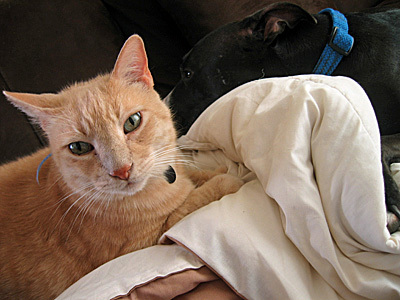 It’s an affirmation of the dog, however; Jeff likes the way she scents the blanket, or he wouldn’t deign to stay there once he’s kicked her out. It’s time for Staff to go blanket shopping. Actually I remember seeing that Staff have many blankets on their bed. This is excessive and greedy of the Staff. 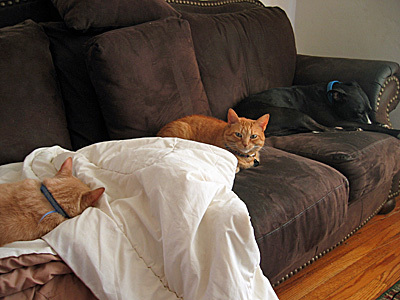 These blankets need deploying to the sofa immediately. Staff can keep warm by running around tending to Jeff and his posse. 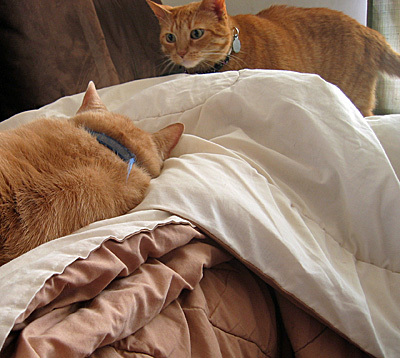 if there were two blankets…jeff would just stretch out to use both. truth. Where is Norman, and does the dog have a name? Is Rita Jeff’s sister or girlfriend? That third photo is classic. El Jefe slumbers in comfort, everyone else has to make do with whatever space is left, and without blankie. He seemed completely unfazed by Rita’s sniffing around, too!